Need to replace the rubber grips on your bicycle or golf clubs? Sounds easy, right? 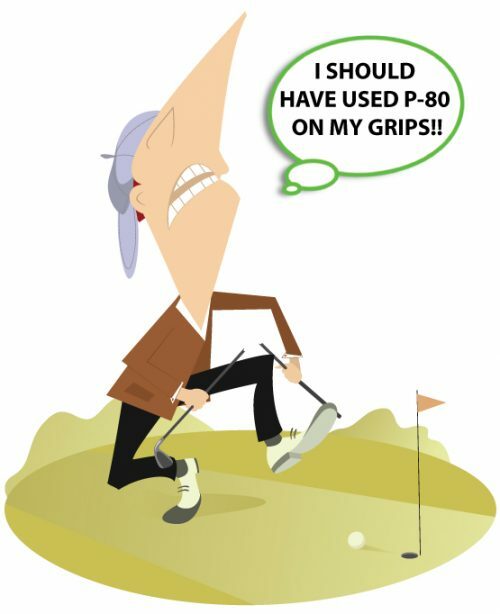 If you’ve ever tried replacing grips on golf clubs, bicycles, motorcycles, tools or exercise equipment you know first-hand how difficult it can be. Foam grips and rubber grips are purposely designed to fit snuggly so they don’t wiggle once in place. Properly installed, tight fitting grips won’t slip when the equipment is in use. But getting them in place, without ripping, tearing or using excessive force, can be a real challenge. Traditional methods of installing grips include using petroleum based products, hairspray, solvents, grease and even soap and water. While these solutions might provide the lubrication needed to install the grip, they can degrade the rubber or they may not dry completely. Both of these scenarios can cause the grips to slip or spin later on while the equipment is in use. Imagine your frustration if you miss that hole-in-one because the new grip on your golf club moved while you were swinging? Experience the Easy Way to Install Rubber Grips with P-80® Grip-It. Grip-It is a quick-drying temporary assembly lubricant that eases installation of tight-fitting rubber and plastic parts by reducing the force needed for assembly. 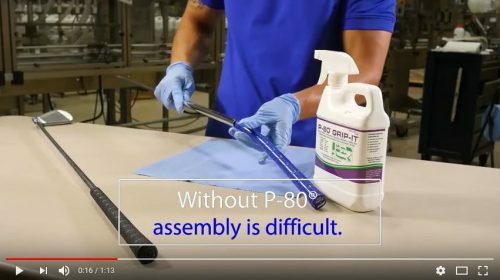 Once assembly is complete, Grip-It dries quickly and provides resistance that helps keep parts in place. Watch below to see how grips slide easily into place (and then stay put) with P-80-Grip-It. Whether you are replacing an old grip on a bicycle or golf club, or installing a new grip on a tool or motorcycle, use this no-struggle method for assembly. Remove the old grip completely. Use a utility knife to carefully cut a slit in the grip. Be sure to cut away from yourself to avoid injury. Thoroughly clean the handle. It’s important to remove any residue left by the old grip. Clean the surface thoroughly and wipe dry. This will make it easier to apply the new grips. Squirt inside of new grip with P-80 Grip-It. Apply Grip-It to the interior of the grip. This can be done easily with a spray bottle. Dipping or brushing application methods also work well. Slide grip easily into place. Once Grip-it is applied the grip should slide into place. Push, rather than pull, the grip onto the handle. Pushing a grip will slightly enlarge the opening, whereas using a pulling motion will decrease it. Be sure to position the grip exactly where you want it, facing in the right direction. Reposition if necessary while the grip is still wet. Allow completed assembly to dry before use. Let the assembly dry thoroughly. Once dry the grip stays in place. 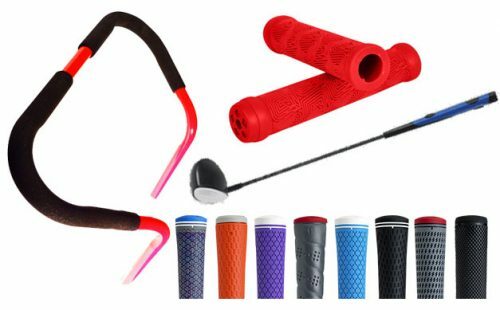 Rejuvenate your old gear with new grips. Grips provide cushioning and support on many types of equipment. In addition to making your apparatus look newer, replacing the grips on your bicycle or golf clubs provides better grip control. Some grips, especially on power tools and motorcycles, protect the user’s hands from vibration and shock. Installing new grips provides you with an opportunity to tailor the size, cushioning, texture and firmness of the grip to best meet your needs. 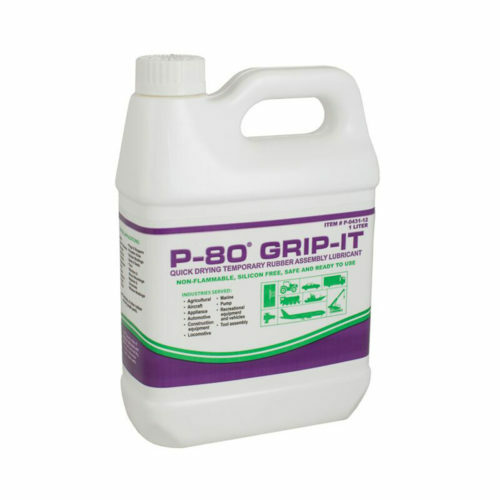 For more information about using P-80 Grip-It to install rubber grips contact one of IPC’s technical specialists.